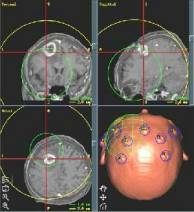 Stereotactic neurosurgery involves mapping the brain in a three dimensional coordinate system. With the help of MRI and CT scans and 3D computer workstations, neurosurgeons are able to accurately target any area of the brain in stereotactic space (3D coordinate system). Stereotactic brain biopsy is a minimally invasive procedure that uses this technology to obtain samples of brain tissue for diagnostic purposes. This procedure is used by neurosurgeons to obtain tissue samples of areas within the brain that are suspicious for tumors or infections. The main indications for stereotactic biopsy are deep-seated lesions, multiple lesions, or lesions in a surgically poor candidate who cannot tolerate anesthesia. 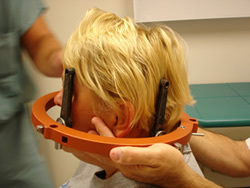 On the morning of surgery a headring is placed on the patient. This involves numbing the skin in four areas and placing the ring on the head with four pins. A CT scan is then performed. In the operating room, the patient receives light sedation. An incision only a few millimeters long is made in the scalp and a small hole is drilled into the skull. A thin biopsy needle is inserted into the brain using the coordinates obtained by the computer workstation. The specimen is then sent to the pathologist for evaluation. Patients are monitored for several hours following the procedure and usually go home the same day. The risks associated with stereotactic brain biopsy are minimal. Sometimes the sample of tissue obtained may be non-diagnostic, which may warrant a repeat biopsy. Other risks include intracranial hemorrhage, seizure, or infection. The University of Florida Department of Neurosurgery is one of the leading centers in the country for stereotactic surgery. Please contact Dr. Friedman or Dr. Foote for more information.